Outdoor enthusiasts whether hunters, fisherman, or birders will enjoy a cozy place to lay their weary heads at night. We supply the cabin plans, you provide the landscape. 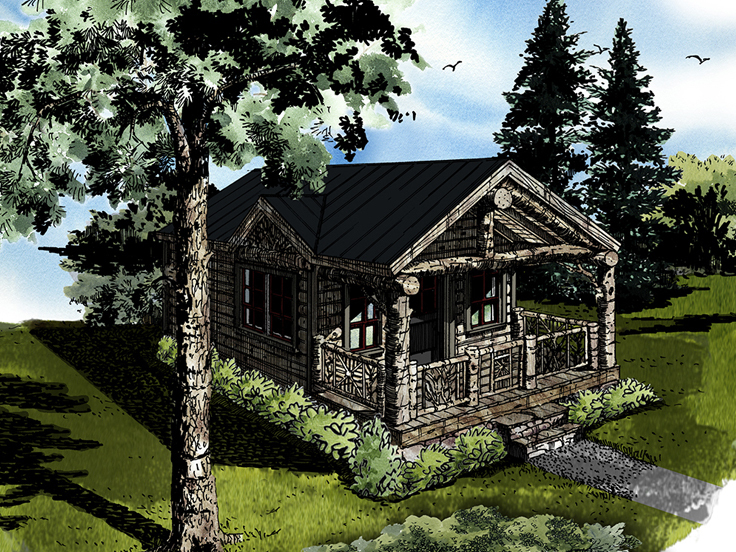 066H-0006: Take a look at this handsome and rustic cabin plan. What a beautiful way to provide the basics. This open design presents comfortable living space that looks out to the world through a wall of windows. A fireplace on one end, warms the chilly evenings and an outdoor living room on the other end offers a place to visit with family and friends or just enjoy the views. Two bedrooms and two full baths round out this home away from home. 027H-0153: This simple cabin house requires little upkeep yet offers all the essentials. There’s a place to sleep, eat, clean up and chill out while warming up next to a wood burning stove. Kick back in a rocker on the porch and cast a line into the lake or watch the deer frolic in the evening light. You’re sure to find relaxation with this cozy home. 012H-0266: Here is a vacation cabin designed with a wrap-around porch for enjoying a rear view. A bench and hooks at the both entrances help keep outerwear in tow. This open design features an eating bar and a hearth warmed great room. Keep the family in clean clothes with a washer and dryer off the mud room. Pull down stairs access attic space for storage. 072H-0198: A fresh modern look with lots of windows to enjoy the view are the highlights of this vacation house plan. A two-way fireplace warms the open living space and the bedroom. Concealed by double doors, the washer and dryer keep clothes and linens clean. With its separate tub and shower, the full bath offers choices for the occupants to invigorate themselves with a shower or to soak in a warm tub. For more choices like these, please browse our cabin house plan collection. Attention all hunters! The fall hunting season is nearly upon us, and you are probably already imagining a chilly fall morning with a trophy buck in your sights. Do you know what would make your fall camping trip even better? A brand new hunting cabin! If you like the idea of giving up the rickety ole’ camper on cold rainy nights for the comforts of a more accommodating “camp,” you should consider building a cabin house plan. Cabin house plans are designed to provide all of the basic necessities and blend nicely with wooded surroundings. While most are rustic looking, they vary in style, and typically offer no more than 1200 square feet of living space. 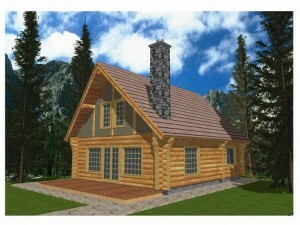 032H-0005: This two-story cabin house plan is just right for a couple of hunters or your family. With three bedrooms and two baths you can accommodate the kids or your hunting buddies. A compact kitchen and dining area make it easy to enjoy a warm meal after the hunt, or fire up the grill or smoker on the deck if you prefer. Everyone will appreciate the living room fireplace on a cold day. There’s plenty of storage upstairs offering a place to store your hunting gear until the next hunting season. 066H-0033: A rustic exterior and covered front porch make this cabin house plan the ideal fit for a wooded lot with a view. Its 216 square foot floor plan makes the most efficient use of space. Combined living and sleeping areas eliminate the need for walls while ensuring a warm place to relax and rest at the end of the day. A compact kitchen offers a place to make coffee or cook a pot of stew. A space-saver bath completes the design. For those who spend the majority of their time in the woods, this cabin house plan offers just the right amount of space. 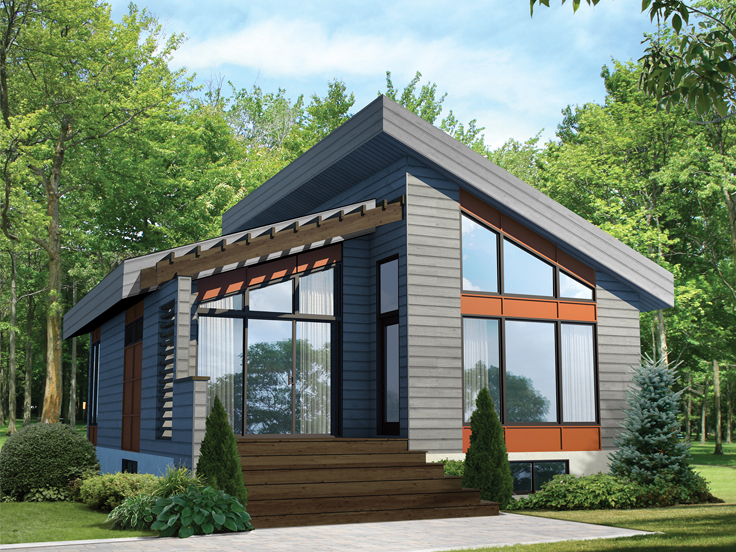 072H-0185: Here’s a cabin house plan with a modern twist! The covered porch and plenty of windows allow you to enjoy the view of your property while still blending nicely with the surrounding wooded landscape. With just 480 square feet of living space, the floor plan delivers modest accommodations. The kitchen lines one wall of the combined living and dining space where you can kick back and relax at the end of the day or plan tomorrow’s hunt. A comfortable bedroom and a full bath complete this cozy cabin plan. 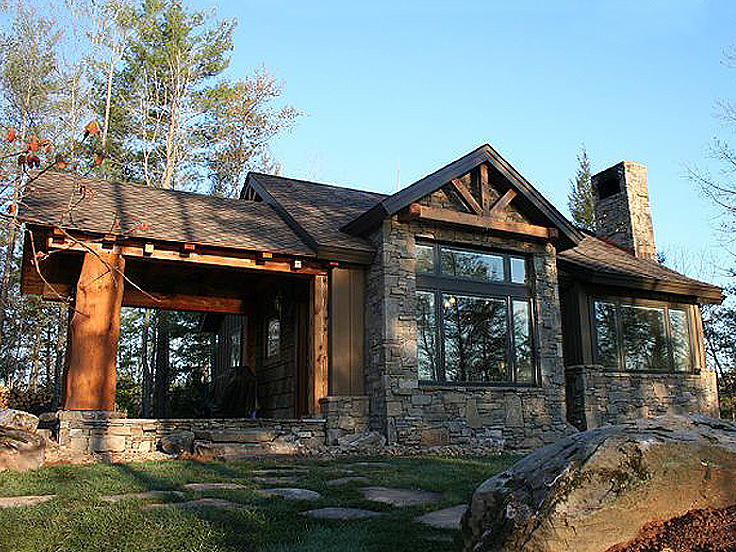 If you have a special property that you head to every year for the fall hunting season, enhance the value of your property and enjoy your next hunt by building a comfortable cabin house plan. 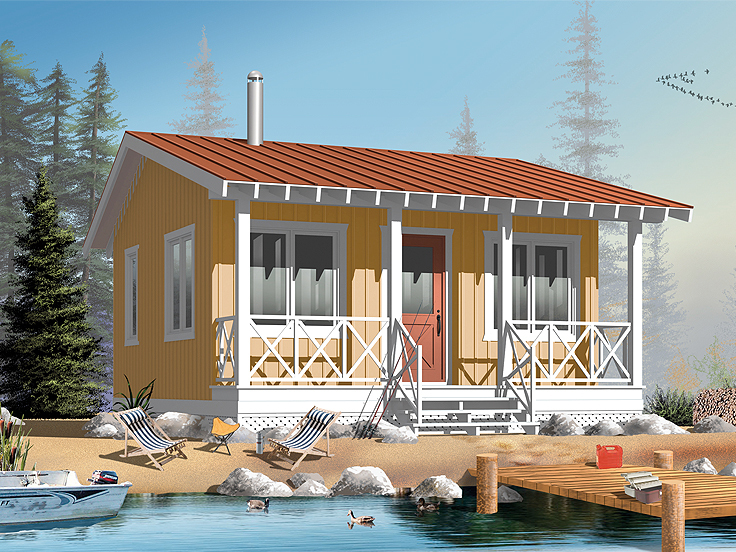 While cabin house plans offer the ideal living quarters for hunting, they are also just right for rental property, a lakefront getaway or your vacation home. Cabin plans are flexible, comfortable and accommodating, making them suitable for a variety of uses. Take some time to browse our collection of cabin house plans to find one that is just right for your needs. At some point in time, we all need to escape our busy lifestyles and demanding work schedules. For some, this means a getaway to the mountains or relaxing a favorite fishing lake. For others, it means soaking up the sun on the beach or eating dinner on the deck while listening to the ocean waves crash in the distance. Whether you prefer a warm vacation or mountain escape, we have the vacation house plan for you! So if you’re the type who wants to have your own vacation home in your favorite city or town or in your favorite secluded space, considering building one of our vacation homes. 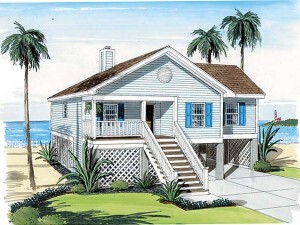 Our vacation house plan collection features floor plans that offer 1500 square feet of finished living space or less. Though small and accommodating, these designs are used for recreational residences or secondary homes. They are perfect for long weekends with the kids, mini-vacations, and hunting/fishing retreats. Also, they can serve as a source of income to those who choose to rent them out to others looking for a break from our fast-paced world. Vacation floor plans generally include one or more bedrooms and baths and modest features. The living areas are often open to one another creating as spacious feel for an otherwise small space. Also, this allows for flexibility and maximum use of the space. Though special amenities may be lacking, the basics such as a compact kitchen and a stackable washer/dryer unit deliver cozy yet comfortable space. Typically, vacation house plans blend well with their surroundings and are designed to make the most of panoramic views, natural features and location. They commonly encourage the enjoyment of nature by incorporating walls of windows, sweeping porches and large decks strategically positioned to take advantage of the surrounding landscape and stunning scenery. Low maintenance is “key” when it comes to vacation homes. The exterior requires little upkeep and the interior provides simple accommodations. Fashioned with efficient living spaces, vacation homes are designed to promote relaxation and comfort giving you a place where you can get away from it all! 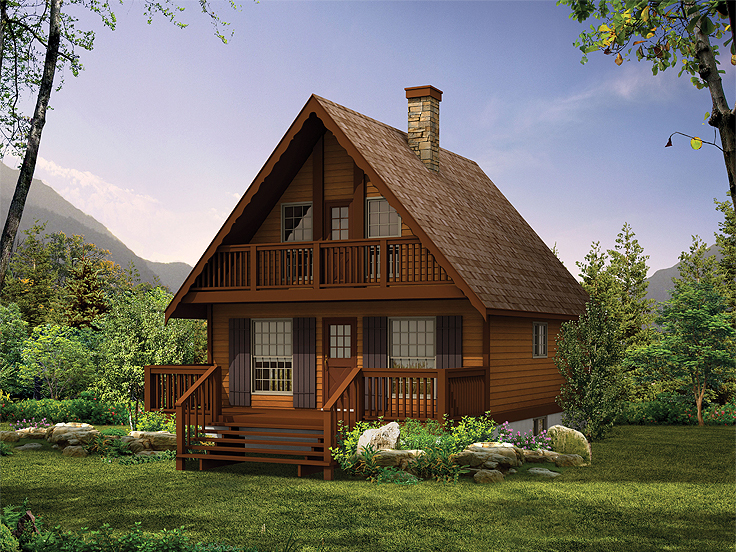 Designed for woodsy getaways, this log cabin house plan is sure to please you. The structure is composed of true logs and accented with stone allowing it to blend well with the natural surroundings. An open deck encourages grilling, conversation, relaxation and the enjoyment of nature. Just imagine stargazing with your loved one after a tasty outdoor meal. Passing through double doors you’ll find a welcoming floor plan where the great room, dining area and kitchen team up creating an open and casual atmosphere in front of a crackling fireplace. Special features here include a breakfast bar, pantry and two-story ceiling with a view to the loft above. Tucked at the back of the home for privacy, the bedroom enjoys a large closet and immediate access to the full bath. The upper level loft is partitioned making it a great bunk room for the kids or friends sharing a long weekend with you amid Mother Nature’s majesty. Perhaps you’d prefer to use one portion of the loft as a sleeping area and the other portion as an office, sitting room or hobby space. The choice is yours! Note the two large storage closets, ideal for seasonal linens or fishing poles and hunting gear. No matter how you envision this log cabin home plan, you’ll appreciate its comfortable and cozy floor plan as well as its ability to accommodate a broad range of needs. 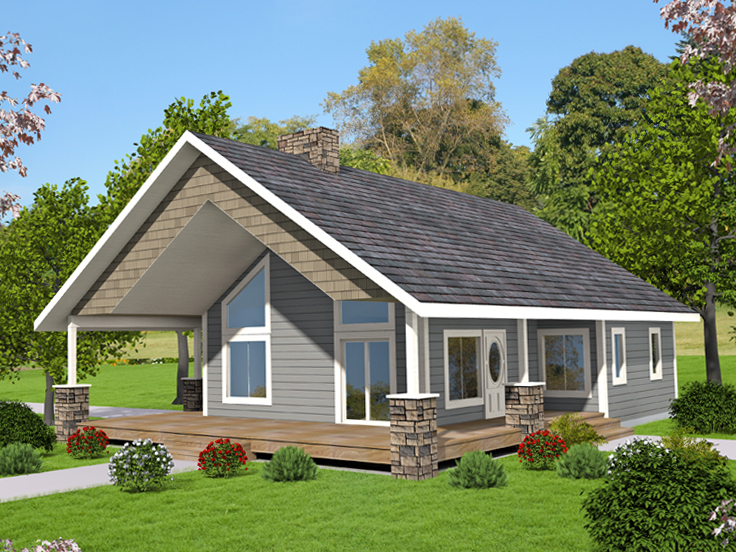 For more designs similar to this log cabin house plan, check out The House Plan Shop’s cabins and cottages collection and our log home floor plans. Whether you are a hunter, a fisherman, a nature lover or an all-around outdoor enthusiast, chances are you might like owning your own cabin. 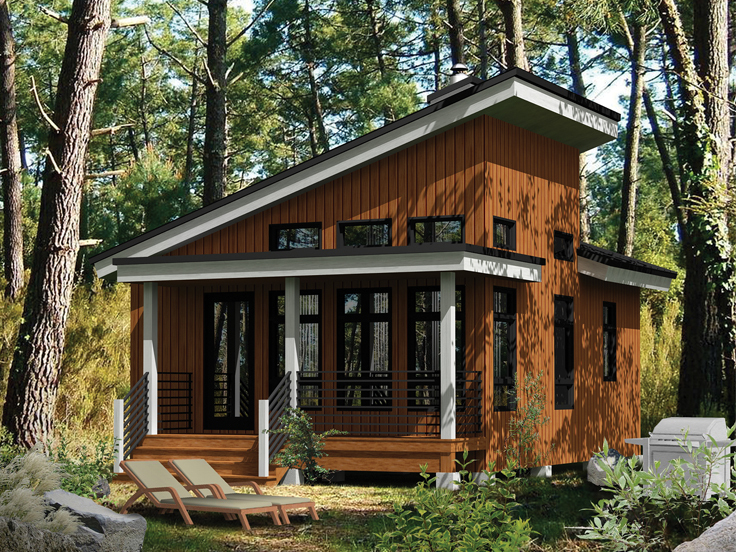 Ideal for a weekend getaways and outdoor sporting trips, this cabin house plan delivers all the comforts of home in a modest design. Exterior stone accents blend nicely with the surrounding landscape while the covered front porch provides a place to take in the sight and sounds of nature. After a day on the lake, a hunting expedition or mountain biking your favorite trail, come home and relax in front of the fireplace. An open floor plan delivers an efficient kitchen and nook overlooking the great room beneath a 9’ ceiling. A comfortable bedroom and full bath offer rest and refreshment. Don’t miss the convenient laundry closet. Follow the turned stair to the second floor where a loft features a built-in desk and offers flexible space for an office, computer room, TV area or an extra bedroom for hunting and fishing buddies or weekend guests. If you are dreaming of a weekend retreat, this cabin home plan is ensures a comfortable and practical place to get away from it all! 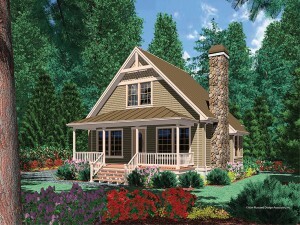 View more cabin house plans at The House Plan Shop.